Authors, illustrators, booksellers, librarians and journalists gathered at Ham Yard Hotel as Two Hoots (Macmillan Children's) celebrated its third birthday and announced its 2019 titles. Suzanne Carnell, Two Hoots publisher, said: "2018 was the third consecutive year of growth for Two Hoots; our TCM [sales through Nielsen BookScan] is up nearly 50% and our international co-edition sales have doubled year on year. What stellar results for an imprint just three years old. 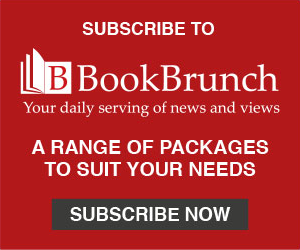 "I am so delighted by the enthusiastic reception our 2019 publishing received. We have an amazing breadth of talent at Two Hoots, both from established names and debut authors and illustrators who we are launching into the picture book world. I know these will be our stars, award winners and bestsellers of the future." Among the highlights of the presentation were The Misadventures of Frederick, the first of two books from debut author Ben Manley and illustrator Emma Chichester Clark (world rights from Emma Chichester Clark's agent, Caroline Walsh at David Higham, and Manley's agent Paul Moreton at Bell Moreton Lomax); Emily Gravett's Meerkat Christmas - her Meerkat Mail is her most successful picture book to date, with worldwide sales of more 270,000 copies; and debuts by Puck Koper (Where is Your Sister, March) and Kate Read (One Fox, August). 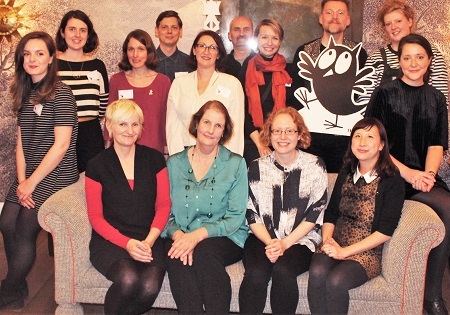 Photo (Rob King): seated l to r: Emily Gravett, Suzanne Carnell, Morag Hood, Sharon King-Chai; standing l to r: Bethan Woollvin, Maisie Paradise Shearring, Daisy Hirst, Ben Manley, Kate Read, Chris Inns (art director, Two Hoots and Macmillan Children's 0-6), Elina Ellis, David Roberts, Puck Koper, Helen Weir (editor, Two Hoots).